Unfortunately, I found myself the other day in extreme pain. It’s a long story, and I won’t bore you with the details (teeth-related, ugh). I’m much better now. Earlier in the day though, I was whimpering and crying on public transportation on the way home. I had managed to watch some of the Germany-Brazil game in fits and starts between dozing and cold compresses… and I wondered if I was hallucinating when I woke up to see Germany with five goals. A line of storms rolled in during the dinner hour, and my power flickered on and off… the lights went completely dark at one point but came back on… I could hear the emergency generator in the parking lot singing to life. I dug through my closet and found my emergency lantern and some batteries, and curled back up on the couch like a pill bug. It’s amazing how your perception changes when you’re dealing with base level pain– how you ignore some things entirely (I never once looked out the window to see if it was really storming)– or your anxiety heightens (I was terrified a downed tree would knock out power and then I’d be in the dark, too). At some point, I realized that I needed to make the trek to the pharmacy. Not only had it stopped raining, but a huge double rainbow filled the sky over my building (you could see the ends, tip-to-tip), but I couldn’t get a full shot with my phone. “It’s not everyday a rainbow is over your house,” a neighbor said, snapping many photos from the median. As we drove further into town, we stopped once with no one behind us on the road to get another shot. A parking lot near an industrial strip mall held a cluster of tough looking men in grubby work clothes and boots, pointing their phones at the sky. When we got to our destination, I managed to snap the below. If I wasn’t in such discomfort, I would have gotten the reverse shot too– half a dozen pharmacy employees outside snapping pictures of the double rainbow. “Who’s minding the store?” one of them laughed. I remember thinking the answer didn’t matter. I wasn’t inside more than 10 minutes… when I walked back out the car, it had vanished completely. It was a fleeting moment of joy during a very scary day, and I took comfort in the fact that so many others put their evenings on pause to look up and share this beauty with others. 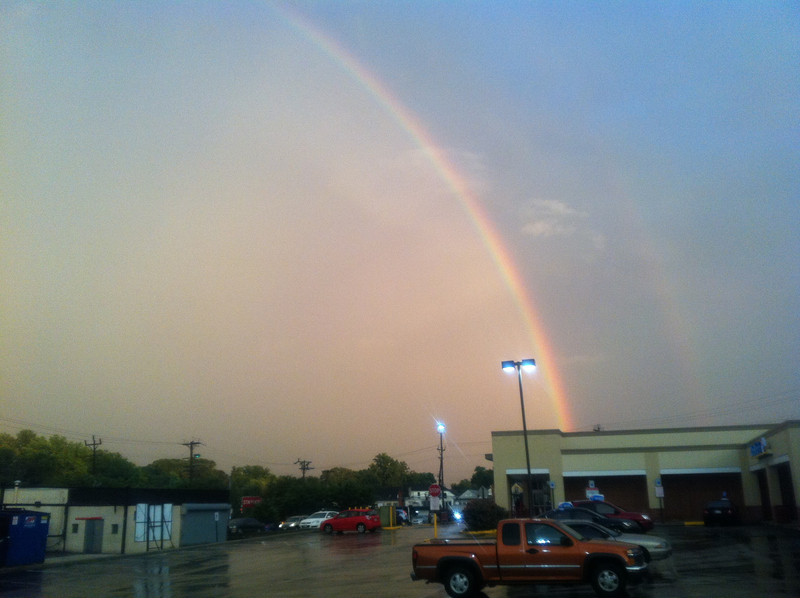 Double rainbow from July 8, 2014. I had just recently (in the last few years) discovered the staggeringly beautiful prose and brilliantly engineered short stories of Bradbury. My first thought was sadness, eclipsed shortly by amusement, upon envisioning Bradbury learning that news of his passing had been broadcast in real time across the airwaves through an opt-in text message alert service. People everywhere jumped on their compact “smart” devices, and accepted the news as it vibrated in (I admit, I also posted the alert on Facebook). In reading obituaries and tributes, others have noted his regard for themes of loneliness and the universal presence of death. Ironically, I happen to be making my way through The October Country, a collection of short stories about mortality. Some are horrific, some are just sad, others are wonderful parables. And that he shall. Bradbury had an essay published in The New Yorker the week of his passing. As an aside, in an interview for a documentary about Walt Disney, Ray Bradbury remarked that he was obsessed with The Skeleton Dance as a child. I think this made me love him even more. 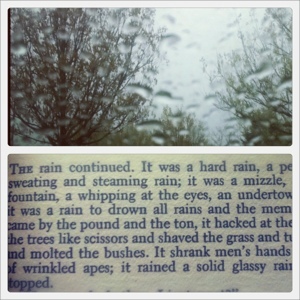 Photos: me reading The Illustrated Man this past spring… Reveling in the rain. One of the hardest lessons I continue to learn is being OK with letting go. I’m not talking about “letting go” as it relates to death, or re-imagining how things might have been, necessarily. It’s learning to be all right with missed opportunities… particularly those that continue to be burned in my brain that I’ve watched slip through my fingertips. Namely, missed photographs. It’s inevitable really. You’re without a camera somewhere, and you can’t turn off your brain. The woman with the neon striped sweater waiting to cross the street cradling a cornucopia of reddish purple flowers… or the moon-faced child with the cut frown mimicking the posture of his father sitting next to him on the metro train. They are split seconds, glimpses, and you’ve just missed them. I try to “sketch” as much as I can in the full sense of Kerouac’s interpretation. I find that I don’t make certain photos sometimes because I want to get in and experience whatever it is—give an account of the minutia—or the things that I noticed specifically that might have been sidelined in a photo—a person’s mannerisms, the way they hold their emotions behind their expressions, the timbre of their voices. Arguably, these things can be captured by video—but I’d rather tell you—filtered through the lens of my own eyes and brain. Unfortunately, time isn’t always helpful. I wait—digest—revisit before writing. Usually when I’m trying to pin something down, but then, memory intercedes and drawn the curtain down on the exact hue of someone’s dress and the cadence of speech… until all you remember is that they were wearing a yellow dress (not canary, not lemongrass) and that they didn’t say anything at all? With those missed “glimpses,” I can always easily say, “I wish I had a camera” as a comfort mechanism. In Indonesia, on the west coast road in Aceh, I sped past moments in a Toyota Highlander with tinted windows, moving with traffic and overtaking trucks and motorbikes, weaving on either side of a single yellow line. We had a system, where I would sit up front with the driver and yell “stop stop” when I saw something, and then would jump out in the shoulder to see if I could get it. In many cases, with my face pressed against the glass, I’ve pick something out 20 yards up the road, and track it as it got closer. I’d yell, “stop stop” when I could actually see it as it passed. But in many cases, we were already long past the spot, and sometimes I never asked to stop. So, high-speed travel is not conducive to photojournalism, but that’s a whole other conversation. My operative phrase was, “I’ll get it tomorrow.” We traveled the same road everyday; I thought I was likely to see some of the same sellers and farmers again. No such luck. In fact, it’s never been the case. To convince yourself that you’ll get a 2nd chance to make a shot of something you saw days ago is foolhardy. And yet, I continued to do it for an entire week. Rice farmers in paddies… two in particular I remember seeing vividly with triangle straw hats. They sat facing away from the road… their feet must have been drawn up in front of them or dangling over the edge of whatever they were sitting on (a board? )… as I could not see them from the road. They must have been taking a rest from farming…sitting about two-man widths apart—I could not tell I they were men or women. Perfect reflections of their sitting torsos and hats fell behind them into the seemingly pure azure water, dappled with rice that lay on all sides…almost making them into strange butterflies with triangle-capped wings. This is the postcard shot I missed. Out of the corner of my eye, I saw a toddler clutching a gun. Was it real? Does it matter? I was sitting with our group in the yard of a family in the village of our translator, paying attention to the conversation and events unfolding before me, when I turned my head. Towards the road, I saw a woman with her head covered with a lemon yellow scarf, holding the hand of a small toddler… maybe age two. The boy waddled slowly, his other hand holding a small dark handgun. It flopped in the open air, ill-supported by his baby wrists. It looked like an old-fashioned pistol… something a gangster would own. I blinked. I squinted harder. The woman and the boy strolled along the road behind a hedgerow and were gone. An extremely loud (and demanding-sounding) brown and white goat snapped me back to reality—insistent with his bleating. I was frozen to my chair, only a few seconds had passed, and I wasn’t completely sure of what I had seen. Remembered for so long…fact and fiction blurred… I wonder if I ever even saw it at all. I’m not immune to fear, I know that now, but I also know I’ll get the next one. I’ve been thinking about the death of luminescence. I recently read an article in the Post about a competition for an affordable “green” lightbulb. The winning unit sells for $50 a piece. Ok, sure. The last American incandescent lightbulb factory closed in September 2010. We’re now in the middle of a gradual phasing out of the bulbs, until we’re left with only the new “energy efficient” models in 2014. Those dreaded acronyms… the CFLs and LEDs! I love the environment– don’t get me wrong– but I protest the phase out of the tungsten bulb at this point in time for an unconventional reason which does impact my daily life– but perhaps has gone unnoticed. These bulbs are not luminescent. Sounds crazy… But really, I think that’s what bothers me the most. The quality of the light itself is different….incomparable. There are no “glowing lamps” anymore. Perhaps this comes from my background in photography, but I find that I always size up the light in a given situation. Flipping through F-stops in my brain, I judge quality, intensity, tone and temperature in a few moments. It’s a habit, even if I’m not shooting. Quality of light sets the scene and dictates mood– any artist or person with Seasonal Affective Disorder will tell you the same thing. These new bulbs, or at least their earlier prototypes (even a few years ago) flickered into being like their older, uglier predecessors…fluorescents… ticking and lighting with a gentle hum, a bluish diffuse light would appear after a delay and slowly grow…as if the sun had moved behind a cloud bank and decided not to reemerge for hours. Light, but not bright. I had an early CFL light in my reading lamp in Boston a few years ago. I found that I preferred to read by the light of the window, or to leave my apartment entirely… than use that lamp. I determined that it replicated daylight on a mediocre day… one where you turn your face to the source and hope you can feel the gradual warmth on your face, but it never quite gets there. Even in recent years, I found myself gravitating towards hideous “grayiege” colored lampshades in Ikea, hoping that they would counterbalance the blue haze. I have an “old bulb” in the lamp on my dresser for when I actually need to see things– to remove a tag, adjust a safety pin or search for matching earrings. This is the detail work that requires extra wattage and warmth… but otherwise, I’m trying to make the switch. I admit, they’re getting better, but I won’t fully be on board until they can replicate that luminescence without just throwing some colored LEDs behind the glass. With an “old” lamp, casting it’s bronze cone around your reading chair, it could be raining sideways outside…wind whipping branches against the windowpanes, daffodils bent face down in seeping puddles, those unsuspecting walkers huddled in the nearest bus shelter…shivering in short-sleeves…but you’d never walk to the window to see. Maybe it’s a false sense of security– to bathe in tungsten light’s warmth– but you want to be where it is. Desire overrides function. We turn on the lights for comfort (as a side note, I read Ray Bradbury’s “The Long Rain” the other day). Now, we turn them on knowing we’ll extinguish them sooner rather than later. I guess “energy savers” have accomplished their goal…because they don’t quite offer what we really want. The other day on the train, my eye fell upon the stack of papers clutched by my seat partner. The text slashed the page; all letters touched together, the rounded curves squashed flat against the bottom line. What language is this, I wondered. I realized at long last that it was English cursive… but a very terrible attempt at cursive. This really did look like chicken scratches or hieroglyphics… it was that bad. I read an interesting article this morning in the New York Times about the disappearance of cursive handwriting. Many schools do not teach cursive anymore… most stop their instruction by the third grade… which is, ironically, the last year I remember doing cursive in a formal environment. I was in public school at the time… as a Kindergartner I was given a large landscape-oriented sheet of newsprint with a blank space on top and a block of tri-ruled lines at the bottom. You know the ones I mean… the two inch wide green lines with a dashed demarcation running down the middle… frightening word highways… repositories for the letters I was still learning. At the time, it was not expected that we know how to write in the traditional sense… in fact… we were expected to draw a picture in the blank space and draw squiggles akin to children’s representations of mountains. Up/down/up/down/up/down. It could say whatever you wanted… it didn’t matter. All the pencil peaks and valleys were the same. Then, once you reached the number grades… the mountains came crashing down… real writing was required. I suppose the mountain writing was a way to acclimatize us to the flow and movement of cursive… just a softer, more grown-up squiggle. I probably was dyslexic, but I was dedicated. A different marble composition book was required for every subject, and I used a new page for each assignment to make it seem like I wrote a lot. I must have learned the cursive letters… one at a time, copying them in my wide ruled note book over and over…but my memory is very hazy. All my elementary school classrooms had cursive alphabet borders running around the room near the ceiling line… they were high up there. I wonder if any children actually paid attention to them, craning their necks, following the 52 squiggles left to right… uppercase and lowercase. Sadly, what I remember clearly is that some of the people in my class still couldn’t read by the 2nd grade… and the first class of the year was spent on a remedial alphabet refresher. I don’t remember cursive being required… I wasn’t writing book reports in cursive, nor did I have handwriting tests of any kind. As a 4th grader, I transferred to private school where no one cared about cursive… it just wasn’t done. I remember envying one of my best friends for her cursive “M”s… I practiced my own signature over and over again, in case I grew up to be famous. When I spent time in my mother’s office while on a school break, I took it upon myself to improve my lettering. She made examples of the cursive letters for me, spaced out on a yellow steno pad. 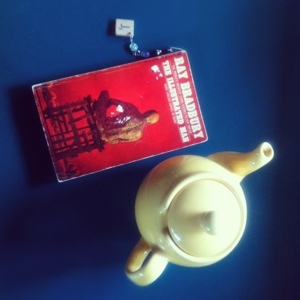 I would sit in a leather high-backed chair for hours, chewing on the straw of my cherry coke, forming the letters over and over… row upon row of every letter, both cases. After many long afternoons in her office, the steno pad was completely filled up with dark blue penmanship. It did not resemble my mom’s handwriting, but at least it was a valiant effort. The Times article mentions that some younger folks can no longer read the eloquent scripted writing… the mythological beast known as cursive. While I may not be an expert in graphology (that’s the study and analysis of handwriting), I feel confident that I can at least READ the stuff… even if my lowercase “u,” “v,” and “w” all look relatively the same. I do empathize, though, with the children who were surprised when they learned that cursive “D” in Disney’s bubbly script at the start of old VHS tapes was actually a “D”! In college and graduate school, I continued to practice my cursive as a deterrent to falling asleep in class. Cursive, since I was not a born natural, required just that extra bit of concentration. I slanted my notepad… pulled out my disposable fountain pen… and began to script continuously. Whether or not I could read it later when studying was another matter… as the smooth squiggles slipped off the lines from time to time, trailing off into swooping curves. I understand that times are changing… that word processing skills take precedent and smart phones, IM and text messaging are pervasive ways of communication. My current print is only a more refined version of the print I did as an elementary-age kid. I value my handwriting. I much prefer to write long hand for just about everything. I’m a list maker, a letter writer, and I have my own wax seal. Believe me; the concept of a blog is still very foreign. Who cares if no job requires cursive… I don’t know many professional scribes these days… but that’s beside the point. Why not learn to do it for the love of doing it? To improve your own print by honing another side of it… or to marvel at the sheer art value if you think it’s otherwise irrelevant? We shouldn’t eliminate these skills from our repertoire simply because they’ve been targeted as “outdated”… ludicrous. Go write a letter in cursive and spend the money to post it… it won’t kill you. If you’re feeling really racy, see if you can use roman numerals in the process… there’s another thing we’re missing out on these days.